Dr. Griffing is manager of the Industrial Electronics Laboratory at the General Electric Corporate Research and Development Center in Schenectady, New York, where his duties focus on the needs of general Electric businesses, including the areas of medical systems, appliances and jet engines. Until January 1995 Dr. Griffing was manager of the Detector Technology Laboratory, where areas of research include several medical imaging projects using x-ray and gamma ray detectors, as well as optical systems for beam steering and signal processing. His current research topics include medical imaging, discharge and incandescent lighting, IC design, and nondestructive evaluation. 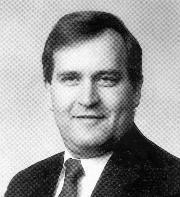 From 1983 to 1985 he served as the GE Corporate Research and Development Center Electronics Laboratory's liaison fellow to Cornell University, where he participated with faculty and students in research in advanced integrated circuit technology. He has served on and chaired program committees for the International Electron Devices Meeting (lEDM) and was general chairman for the 1988 lEDM. In 1982 he received an lR-1OO award for his work on a water exposure system and in 1985 he received a Dushman award for his work on contrast enhanced lithography.